Yes, it's the latest geek gadget, the USB Missile Launcher. Quite why being able to launch a foam missile all of 10 feet, it controlled via your USB cable is beyond me, but there it is. Don’t be fooled by the superficial peace in your office right now. Sure, everything might seem nice and placid, for the moment. Boring, even. But make no mistake: as you blissfully type away, your enemies are out there somewhere, waiting for their chance to invade your cubicle and destroy your way of life, to sprinkle unfamiliar orange snack-food crumbs into your keyboard and reset your Windows wallpaper to something pornographic. When the thin veneer of civilization cracks and your office descends into a brutal Darwinian free-for-all, as all offices do eventually, will you be ready? 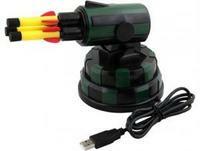 With this USB Missile Launcher, you’ll have the defensive capability you need to ensure the integrity of your borders. Attacks from rogue cubicles can be met with an overwhelming response of sheer foam-rubber force. Chances are the barbarians will move on at the mere sight of your awesome toy arsenal. If not, your course of action is clear: identify the enemy, target the missiles on your PC with a Windows XP-based guidance system, and take appropriate action to rectify the hell out of the situation. Aim at your target and then punish them with foam missiles at the click of your mouse, just make sure they are within 5 to 8 feet. The PC software is included with the USB Missile Launcher that will display a big red shiny button on screen…you know what to-do with that. 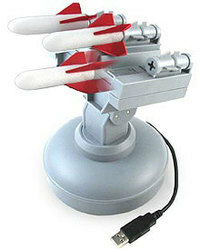 Standing around seven inches high, the USB Missile Launcher requires 3 AA batteries and you. A number of question come to mind (is this what happens to a spitball when it matures?) but I think the most obvious one is that of course, each generation of teenagers does indeed inherit the earth, but aren't they supposed to grow up first? Sounds a perfect device for civil servants at the Rural Payments Agency. They must be running out of things to do (putting cups of sick into filing cabinets now having been cracked down upon) and are in danger of actually having to make payments to farmers. Spitballs? Do I infer that you attended school after the era of ink-wells? Tim adds: Indeed, they even had Biros when I were a lad. People think I'm kidding when I say that the teachers let us use our own quills, but we really did put pocket-knife to bird feather and take the product to school. But then I started school as a wearer of clogs, and people don't believe that either. Now, if it were USB-powered and allowed rotate and tilt (or even a tiny webcam sight device) then I might be keen. "Frankly, this kind of daft-but-fun toy is likely to arrive in an xmas stocking or two..."